Notes: No installer - just unzip and run. Benchmark is second button from the bottom on menu. No video capture possible - probably not using DirectX...? GalMark2002 is a standalone 2D benchmark program that runs four tests and adds them up for a final score. 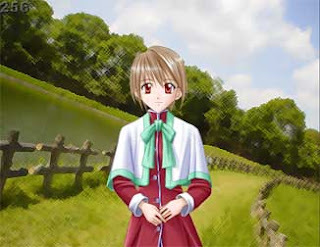 It is presented in visual novel style, with 2D characters and 2D backgrounds, which look like they were photos given a Photoshop-filter treatment. No sound during benchmark. Tests aren't particularly interesting. Short running time, but feels longer. Not recommended.